For this week’s Trendy Tuesday I am showing you how to stack with my favourite bracelet stack from Kinsley Armelle. Lately it’s been all about arm parties and I love how stackable these Kinsley Armelle bracelets are. They have such a great product range with all of them so easy to mix and match. You can keep it simple with some of their basic bracelets like the Khaki gold one shown below or it’s silver Khaki counterpart and layer it with some of their other basic ones. I like to add a bit of sparkle and am obsessed with the big quartz Ice bracelet show below that I also have in black Raven. When I stack I like to add that larger piece for visual interest which I did with this watch (similar here) from an old Trinity Box. I generally keep it to one main arm party, and keep the other arm very minimal with one of my favourite cluster bracelets or nothing at all like in this outfit, but sometimes I break the rules like I did in this previous Trendy Tuesday and wear a full arm party on each wrist. The stacking possibilities are endless, have fun with it! That’s it for this week’s Trendy Tuesday and my favourite way to wear stacked bracelets. Stay tuned for this Friday which will feature many of my favourite beauty products with an Instagram giveaway! 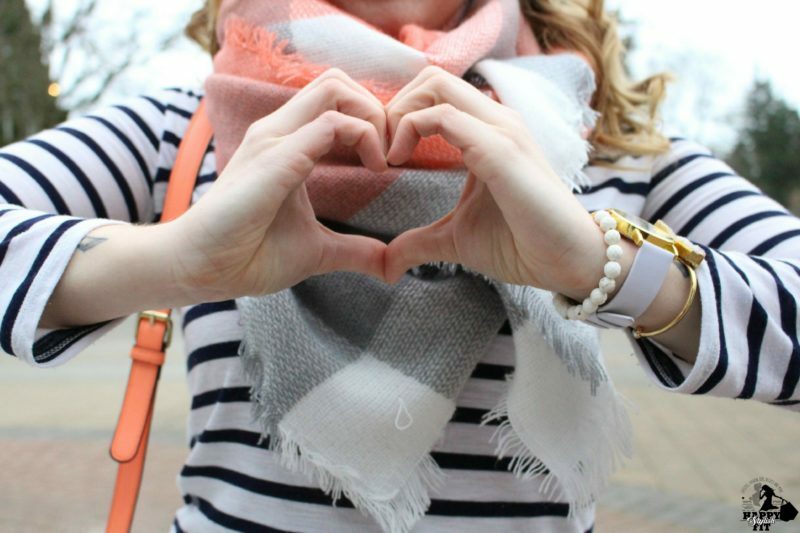 Love how you styled these bracelets and love the scarf ? Love the look! So pretty.. where is the watch from? Thanks Suvi. It’s from a Trinity Subscription Box. There’s a link if you’d like to check out what their boxes are like. Oh my gosh so cute! I originally was going to ask about your tattoos and then I saw the inside of the watch and I don’t know what I’m more curious about! That little atlas in there was so unexpected, I love it!! where is it from?